The Futhorc: Ancient Runes Are Not Magical! I always feel a sense of frustration at the possition the Futhorc holds in our society: one similar to that held by Tolkien’s Elvish Tengwar. 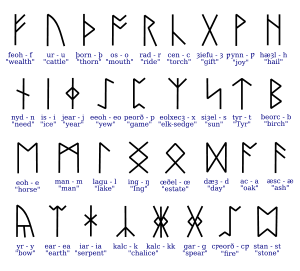 To the average person, the runic alphabet symbolises magic, mystical creatures, a general lack of civilisation, and is treated as being trivial. Just because the language is no longer alive, it seems to have been put in a box of things from fantasy worlds. Just to set things straight: Old English was a no worse than present day English. Just because they worshipped pagan Gods does not make the language a mystical one. Come to that; from an unbiased point of view, pagan is no worse a religion than Christianity, it’s just that it got wiped out by it. Yes, the alphabet looks mystical. That’s only because it’s no longer used. Out of the top 100 words used in the English language, all but six are direct descendants from Old English. The name Futhorc (or Fuþorc) comes from the first six letters of the alphabet; just like alphabet comes from the first two letters of the Greek alphabet. There are thirty-four letters, which have different names, and each have a different sound. This leads to less confusing spelling than Present Day English. There were around 30,000 words in Old English – but remember, there would have been more, unrecorded words, as it was a mostly spoken language. They had grammar (including a more complicated case system than Present Day English), poetry, stories: everything that makes a language “real”. So stop with your dreams of faeries and goblins and witches running around in forests turning each other into toads and all sorts. Old English deserves more respect! I’m glad you’re doing Medieval Mondays. It’s something I know so little about that it piques my interest.